Pope’s message for World Day of Migrants and Refugees is released. 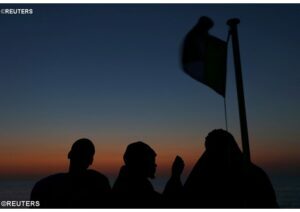 This photo of African migrants are seen on the bow of the former fishing trawler as they are transferred to Trapani port in Sicily. – REUTERS. Click on photo to read the full story. This council lays stress on reverence for man; everyone must consider his every neighbor without exception as another self, taking into account first of all His life and the means necessary to living it with dignity, so as not to imitate the rich man who had no concern for the poor man Lazarus. Respect and love ought to be extended also to those who think or act differently than we do in social, political and even religious matters. In fact, the more deeply we come to understand their ways of thinking through such courtesy and love, the more easily will we be able to enter into dialogue with them. This love and good will, to be sure, must in no way render us indifferent to truth and goodness. Indeed love itself impels the disciples of Christ to speak the saving truth to all men. But it is necessary to distinguish between error, which always merits repudiation, and the person in error, who never loses the dignity of being a person even when he is flawed by false or inadequate religious notions. God alone is the judge and searcher of hearts, for that reason He forbids us to make judgments about the internal guilt of anyone. The teaching of Christ even requires that we forgive injuries, and extends the law of love to include every enemy, according to the command of the New Law: “You have heard that it was said: Thou shalt love thy neighbor and hate thy enemy. But I say to you: love your enemies, do good to those who hate you, and pray for those who persecute and calumniate you” (Matt. 5:43-44). “The Pastoral Constitution on the Church in the Modern World,” Vatican II, paragraphs 27-28. Read a letter about the Feast of the Holy Family from The Jesuit Conference. The Jesuit Conference is a governing body for Jesuits in Canada and the United States, offering guidance to Jesuits engaged in the Society’s ministries.